Lou Dalgleish and Micheal Weston King. Not taken at gig. 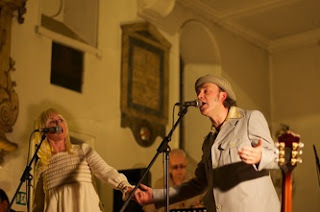 “This full band show entertained those present and is something to try and catch during its numerous performances up and down the country.” – Three Chords and the Truth UK July 2012. Nearly four months after briefly mentioning My Darling Clementine in a review of the Maverick Festival, the opportunity finally arose to attend one of their full length shows. In the intervening period since that brief festival introduction to this project, the album HOW DO YOU PLEAD? has been listened to, analysed, praised and ultimately acknowledged that all the hype surrounding the reviews is fully justified and a better UK produced country record certainly doesn’t easily come to mind. While the theme around the album, and its live rendition, is to hark back to the golden age of country duets, it’s far more than a retro- infused tribute show. With a batch of high quality songs, all possessing a timeless feel to them, the finesse, passion and top quality performance by husband and wife collaborators, Lou Dalgleish and Michael Weston King, suggest the focus on this type of music should be the future not just the past. While being unashamedly pretentious in the following comment, this concept album takes you on an emotional journey through a relationship breakdown that in true country tradition doesn’t have a happy ending, although it does fall short of including the ubiquitous killing song. With each track the story meanders along before reaching its inevitable conclusion. Without going into too much detail about it, just obtain a copy and enjoy the listening experience yourself. So prior to its live airing, the question was pondered ‘Would the album be played in track order?’ Well the answer was, not exactly, and this potentially leaves an opportunity to develop a future show around its narration, a suggestion surely containing some mileage and worthy of consideration. Back to the live show and inevitably the opener, in line with the album, was ‘By a Thread’ and it would be virtually impossible not to close the evening without the emotional and heartfelt concluding track ‘Goodnight Louise’. In between, the healthily-sized audience were served all but one of the album’s eleven other tracks, albeit as indicated not necessarily in recorded order. For information, the poignant song ‘She is Still My Weakness’ was the omitted number but it would be far more positive and relevant to focus on the best of the others. From such a fabulous collection of songs, it is unfair to single out any individual performance but deserved mentions must go to ‘Going Back To Memphis’ , ‘Put Your Hair Back’ and ‘Departure Lounge’. The first is probably the album’s standout track and, sadly, Michael’s reference to it being a response to Tom T. Hall’s ‘That’s How I Got to Memphis’ passed most of the audience by. Although duet delivery is the format for all of the songs, Lou does take centre stage on the middle of this trio with her own charismatic style and impressive vocals. Finally ‘Departure Lounge’ is also another personal favourite and its introductory reference to Halesowen International Airport had some light-hearted relevance. To enhance the live experience of My Darling Clementine, the band step aside to allow Lou to demonstrate her keyboard skills with a solo performance of Elvis Costello’s ‘Indoor Fireworks’ and leading off a version of ‘Good Year For The Roses’ before Michael returned to the stage mid-song to renew the duet. Many reviews have referenced the band’s resemblance to other iconic country duet acts, this one is just going to name-check the original source of ‘Cause I Love You’; the Johnny Cash and June Carter song performed during the evening, a number they also contributed to a tribute at the Southern Fried Festival in Perth, Scotland. Michael did take time out to preview one of his new songs 'I No Longer Take Pride', which was an indication of an upcoming project. The evening wouldn’t be complete without a mention to the five piece band that expertly back Lou and Michael. Martin Belmont contributes guitar, Alan Cook on Pedal Steel with Liam Grundy on piano and organ. The rhythm section has Martin Cox on stand up bass and Neil Bullock on percussion. All made valuable contributions to the evening’s entertainment. Also World Unlimited deserve praise for acknowledging the talents of the band, bringing them to Birmingham and being rewarded by switching the show to the Hare and Hounds larger room to house the sizeable audience. However the evening was all about My Darling Clementine and the much appreciated and vaunted efforts they are making in taking forward the mantle of the wonderful country duet formula. Hopefully this will continue and be built upon in the future.